Trickbox TV London: outside broadcast OB video production supplier. London, July 2017: Trickbox TV, a leading supplier of equipment and services for studio and location multi-camera productions for broadcast, video production, webcasting and live events, has announced that it has provided a range of outside broadcast services to Eden Sessions. Based at the famous Eden Project site in Cornwall, Eden Sessions is one of the most spectacular outdoor live music events, featuring a series of one-day concerts from world-class artists during June and July 2017, annually. 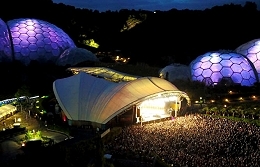 Eden Sessions contracted Trickbox TV to provide a multi camera set-up, including live vision mixing with talkback, tally lights and a 32-foot track, which runs across the front of the stage. The Trickbox kit was installed onsite and remained at the location for the four-week duration of live shows from renowned artists including Bastille, Madness and Van Morrison. The concerts will be shown at a later date on BBC iPlayer.